In case you were wondering what happened to me, especially, since it has been weeks since I posted a recipe. Well, I am safe and sound. There has been too much going on in our lives. We are going to be selling our house and due to that, my cooking has taken a backseat temporarily. We have been prepping our house for the sale. Finally, we are at a point, where the house is ready to go on the market. Once we put our house on the market, the last thing I want to do is make the house smell like spices. Some prospective buyers might like and some might not like spices. So the plan is to make 3-4 recipes so that I can blog about it for the next several weeks. What will I do after that? Not sure. I will think of someway to cook after that. Maybe cook at my friend’s place since they let me know that they are okay with being used as guinea pigs for my recipes! I will let you know how that goes. 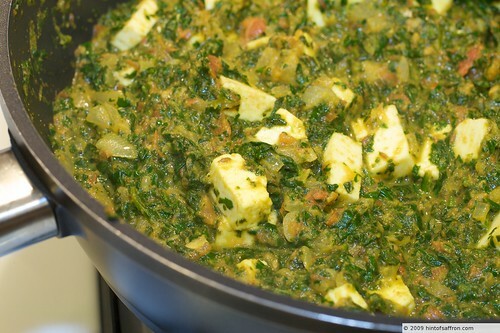 Couple of weeks ago, I decided to make Palak Paneer – literally translated means Spinach Paneer. 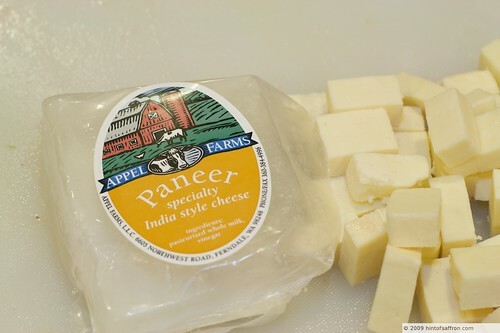 Paneer is an Indian cheese (very different tasting than Soy) that is made with whole milk that has been warmed and then vinegar is added to it to “break” the milk. It is a laborious process. You can buy it frozen from an Indian store or fresh from your local organic grocer. Paneer is very versatile and you can make innumerable dishes with it. I will post some more paneer recipes in the future. The palak paneer (pronounced as paa-luck) that you find at Indian restaurants looks like some green stuff with white cubes in them, Not too appetizing by looks! The palak paneer that I make is a slightly modified version of the one found in one of my favorite cookbooks – Indian Home Cooking . There is more texture to it and you can see the texture of the main ingredients but also tastes really yummy. I made that last week for some of my friends and they loved it. I like to use fresh bunches of organic spinach. 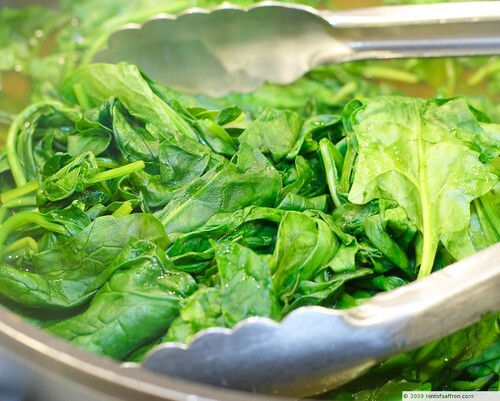 You also have the option of using frozen spinach or pre-washed baby spinach. I prefer the bunches of spinach. Even though it is a little more work to wash and clean, it comes tasting much better. I definitely do not like to use frozen spinach. The final result of making Palak Paneer. Notice the texture of the food. This dish came out excellent and very tasty. It is a easy dish to make. *NOTE: Make sure to use the Indian coriander powder that tastes very different from the non-Indian ones. You can either order it online (the link is provided above) or buy it from an Indian store. In a large saucepan, add water and turmeric and spinach. Cook over medium-high heat, turning spinach occasionally, until wilted, approximately 3-5 minutes. 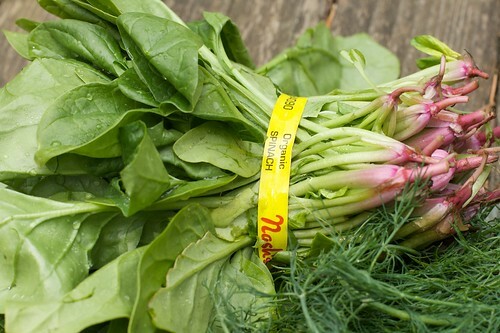 Remove from heat, drain excess water and let spinach cool. 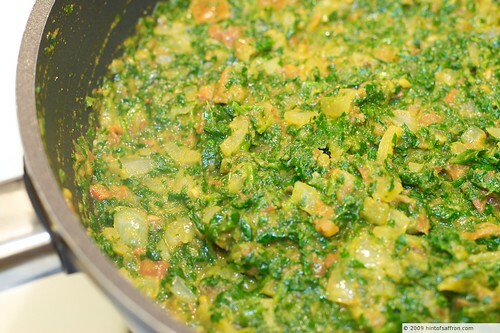 Puree the spinach in a food processor coarsely and set aside. Rinse the saucepan with water and wipe with a paper towel. Heat the ghee and oil mixture over medium heat. Add cumin seeds and cloves and cook until fragrant, approximately 30 seconds. Add the chopped onions and salt and cook onions until translucent, approximately 5 minutes. Find the cloves and remove them. Add the fresh chili pepper, crushed coriander seeds (or powder if seeds not found), ginger, garlic and chili powder and cook, stirring, until fragrant, approximately 2-3 minutes. Stir in tomatoes and turmeric and cook for 5 minutes, until tomatoes are soft. Add the pureed spinach and mix well. Add paneer and stir gently to coat with sauce. Cook over medium heat for 2-3 minutes, until paneer is warmed through. Sprinkle with fenugreek leaves and stir and serve hot with naan or chappati.